Here's the overview of weeks 5-8. We're still covering Life Science these weeks. You can find out about Weeks 1-4 here. Mighty fun! 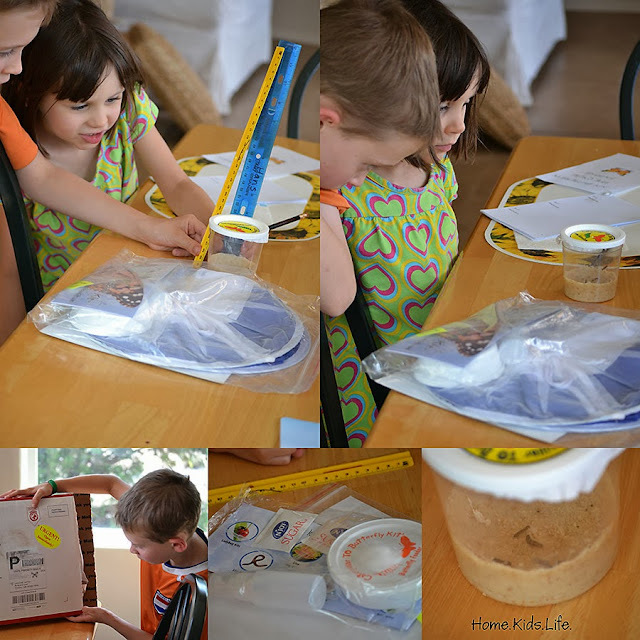 We got our first caterpillar to butterfly kit. 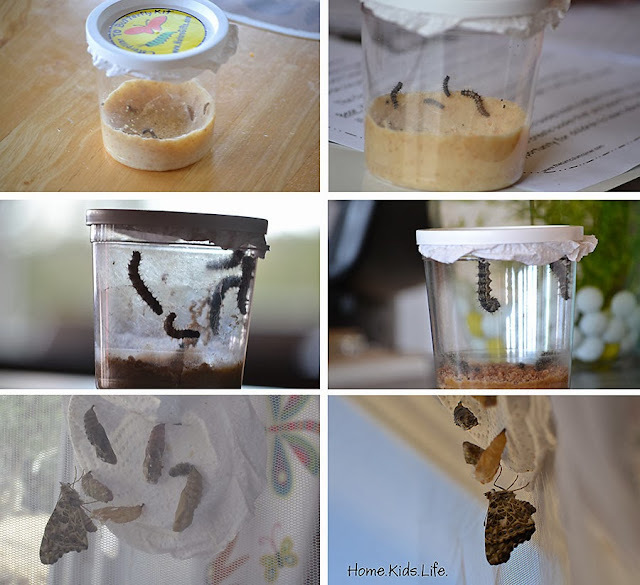 As I write this, we've just had our third butterfly emerge from its chrysalis. It's super exciting. We actually got to see one butterfly emerge, it happens pretty quickly. One butterfly only emerged halfway and has since ceased to be living. The first one to form a chrysalis still has yet to emerge. It's been quite fun and thrilling to watch all the changes. We even named all our caterpillars/butterflies...Aslan, Peter, Susan, Edmond and Lucy. (Bonus points if you know where the names come from!) It's amazing how tiny they start, how big they can get, and how different they look as butterflies. Truly amazing. There may just have been some candy involved in the classifying bit. But only if you like candy. The lab part focused on three of the kingdoms: fungi, monerans, and protists. The monerans gave us a fun lesson on why it's important to wash our hands. 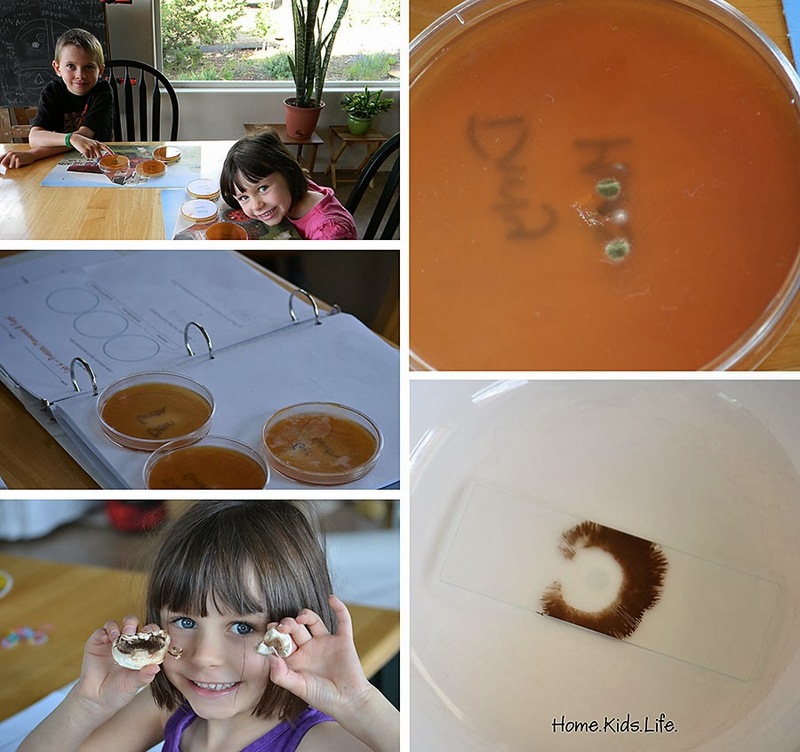 We made petri dishes and had the kids put their finger into it. They did a plate with a dirty finger, one with a finger washed with soap and water, and another with a finger cleansed with antiseptic gel. Only the dirty plate grew stuff. Great example about washing hands!! And my son's dirty finger plate was disgusting. He had bunches of stuff growing on it, I assumed it was from stuff under his fingernails. Yuck! We immediately cut his fingernails after that. Gross. My daughter didn't have much growing on hers. Fun with plants. 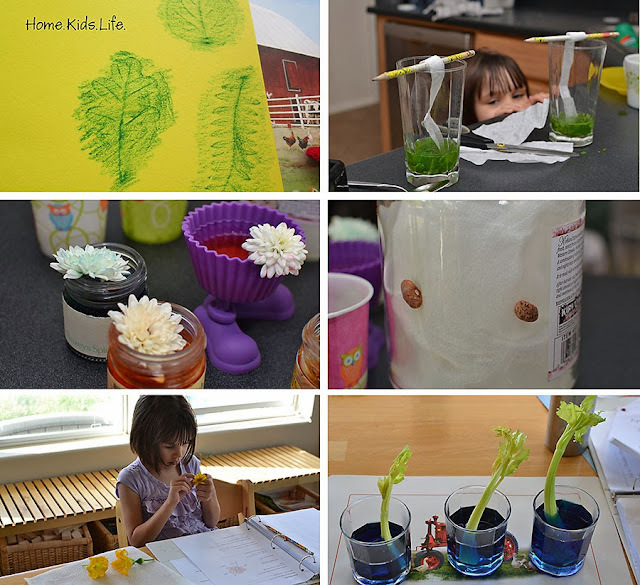 We did quite a few experiments and even took a walk outside to collect leaves. The kids were impressed with white flowers that became colored while sitting in water colored with food coloring. We focused on Invertebrates and then Vertebrate groups. 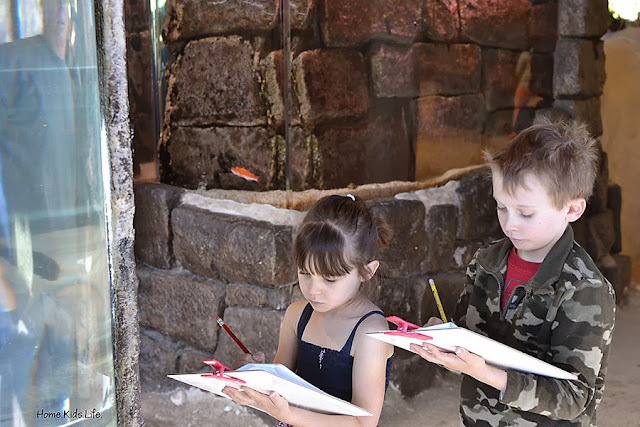 Our animal week ended with a trip to the local aquarium to find Invertebrates and different Vertebrate groups. The kids had a packet to fill out while they were there and had to draw different animals. It was a fun-filled day! I love being able to go places when they aren't so crowded with kids out of public school. We use to be there when our kids were in public school and the zoo/aquarium/botanical garden would get crowded during school breaks. I'm taking advantage of our homeschooling time to visit certain places when they aren't so busy! And that is four more weeks of Science! I'm getting a little behind in writing the curriculum! I'm barely staying 1 week ahead now. Hopefully I can continue to post these every 4 weeks! Enjoy! I am excited about finding and using your Science Curriculum. We homeschool as well, kinder and 2nd, this curriculum you have created and are generously sharing is approachable, engaging and fun. Looking forward to the following lesson plans. Thank You. Thanks so much Adela! I'm doing my best to try and keep up, but I know I'm falling a little behind in posting! I've got weeks 9-12 that I need to turn into PDFs and post. I know it's not written perfectly, but I hope you can find items that your children enjoy and finding interesting. You've got me motivated now, hopefully I'll get it post the next section soon. Thanks so much for stopping by! And have fun with your young ones!